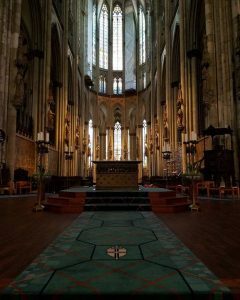 The high mass at the Cologne cathedral was something completely foreign to me. I have gone to christian reformed church services my whole life so it was very interesting. The differences were many. The most obvious was that it was in primarily German and Latin. There were a great number of traditions that I had never seen. Most of these traditions seemed pointless to me. While they might create a sense of reverence, I don’t think that they would make God any happier than an normal service in an average church. Every day thousands of people visit the Cathedral and I think that is fine. While in the service the people waiting were noticeable, however; they were not disruptive for me. Also, though the cathedral is a beautiful place, it is not any holier than any other place of worship. Additionally, if the beauty of the cathedral manages to bring even one tourist to God then it is worth it to keep the doors open. Worshipping in the Köln cathedral was a very cool experience of which the highlight was the beautiful organ music. The atmosphere was almost magical, reverent and imposing, but it was ruined for me by the constant babble of tourists from the back of the sanctuary. They provided an incessant hum that kept strong throughout all the prayers and times of silence. It made me feel sorry for the worshippers and clergy who frequented the cathedral and had to deal with the tourists all the time. That being said, I am very glad I had the opportunity to attend a worship service in such a cool place. Author Robert CapozzoliPosted on August 19, 2017 August 19, 2017 Tags blogQ4Leave a comment on The Architecture! At first I thought that my inability to write a blog on time was a problem. As I try to write now however, I find that I am grateful that I didn’t write it on time. Sure it would have been nice for my friends and family to know what I have been up to the previous weekend, but the thoughts I hove would have been rushed, quickly jotted down without a second thought. this way I think back and remember what I liked the most about that trip. With that being said, there is a large amount from Köln that I will remember for a long time to come. My favorite part of the trip was the Cathedral. It was a couple of weeks ago, but I can still the the enormity that it had. every inch of the outside had some sort of detail or symbol on it. As you got closer you got to the Cathedral you could see all the dedication that people had put into it after hundreds of years of work. As I walked into the Cathedral I held my breath in anticipation. It was spectacular, and I knew the work that is put into Cathedrals to make them sound incredible. We walked in as tourists as an evening service was taking place. My heart stopped when the organ played. It filled the space, and no matter what direction you turned, the sound was perfect. It is incredible to think that people made that building all in dedication to God. We don’t do that anymore. How often do we go through our day doing things only for ourselves? How many times do we sleep in a Sunday instead of worshiping the God who gave us everything? If building a Cathedral is what a group of people could do in a lifetime, imagine what we could accomplish if we lived every day to the glory of God. Let me start by saying that I have attended many types of worship services. I went to a conservative Lutheran Church until I was 7. 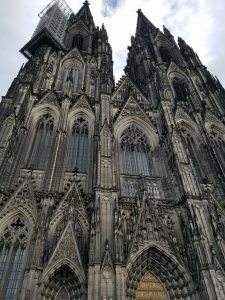 I have worshiped in several different countries, seen charismatic and high liturgical services but no church service or mass that I have ever attended was as amazing as the mass we attended at the Köln Cathedral. By saying this I do not mean the content of the service was amazing as I only understood parts of it, but the grandeur of the service itself was overwhelming. The service involved almost every sense from smell with the incense to sight with how the Cathedral was beautiful and absolutely colossal. It’s a form of worship all by itself. The service was quite different from my home church. My home church is in the inner city on the west side of Chicago. It’s very diverse and much smaller than the Cathedral, not to mention the difference in language, content, worship music and tone of the service – people shout out in our services and that wouldn’t happen in the reverent Catholic mass.